Getting certified is a proven way to advance your career in the IT industry. Whether you’ve recently finished an IT apprenticeship, are a university graduate or completely new to IT, a certification will prove your skills to managers and employers. But with thousands of certifications on the market, which should you achieve? Read on for an in-depth look at 10 entry-level IT certifications, ideal for anyone aiming to prove their skills at a beginner or intermediate level. This list (in no particular order) covers cyber security, project management and cloud computing certifications. Cisco is a networking giant and the vast majority of internet traffic travels on networks built using their products. Alongside their networking hardware, Cisco also manages a comprehensive certification portfolio. Among networking professionals, the CCNA Routing and Switching is the most popular and widely-attained of all Cisco certifications. Achieve it and you’ll prove your ability to work with Cisco networking tech and be on track for a £40,000 salary (ITJobsWatch). The CCNA will also build your skills in IPv4 and IPv6 networks, network devices, security, troubleshooting and teach you how to implement a scalable medium-sized network. To achieve the certification, you must pass two exams (which can be taken and studied for separately). First, you’ll need to pass the ICND1 which will earn you your CCENT certification. Next, pass the ICND2 to achieve your full CCNA. Alternatively, if you’re aiming to build cloud skills, or want to work in roles Cloud Engineer and Cloud Administrator roles the CCNA Cloud certification is also well worth achieving. The Certified Ethical Hacker (CEH) certification teaches IT professionals how to use real hacking tools and techniques. But this certification isn’t aimed at black hat hackers or script kiddies. By learning how to scan, test and hack your own systems, professionals that hold the CEH certification are able to approach cyber security from the perspective of an attacker, spotting vulnerabilities in business networks – and then working to patch them up. Become a Certified Ethical Hacker and you’ll learn how to write exploit codes, perform privilege escalation attacks and identify common attack techniques, like SQL injection. Hands-on experience is key to passing the CEH exam; Firebrand’s official CEH training includes access to over 2,200 hacking tools and 140 real-world labs. The CEH is well-suited to professionals that already possess other entry-level certifications, like the Network+ or Cisco CCNA, that are looking to get hands-on experience in IT security. This certification is also ideal introduction to a career in penetration testing. Once certified, continue building your penetration testing skills with the follow-up ECSA certification. Networks are the first line of defence against cybercriminals, but when poorly managed they can be an open door to an organisation’s critical infrastructure, applications and data. Launched in 2016, the Certified Network Defender provides networking professionals with a route to building and certifying knowledge of skills in network security. This makes the CND certification ideal for IT and network administrators that want to expand their security skills. To achieve this certification, you’ll study CND’s 14 network security domains and gain the skills required to protect, detect and respond to threats. You’ll learn how to act as the first responder to any network security incidents as you develop skills in network security, risk assessments and firewall solutions. Plus, the CND is vendor-neutral, making the skills gained valuable to professionals regardless of their experience or knowledge of technology. Simply put: if you’re involved in projects, you’ll benefit from PRINCE2 certification. This is the go-to project management certification for professionals in Europe and provides a common language and structure for all projects and PRINCE2 knowledge is crucial for professionals working on projects that use the methodology. By achieving the PRINCE2 Foundation & Practitioner certification, you’ll master a vendor-neutral, best-practice-based approach to managing projects – valuable for any professional, regardless of industry or vertical. The certification is split into two levels, Foundation and Practitioner, and was recently updated in response to feedback from industry experts. Ideal for entry-level and beginners, achieving the PRINCE2 requires no prerequisites and can be undertaken at any stage of your career – though you may find it rewarding to achieve it early on. For professionals that need new skills quickly, Firebrand provides the fastest PRINCE2 Foundation & Practitioner certification. In just 3 days, you’ll achieve your full PRINCE2 qualification – that’s a world exclusive. Windows Server is a robust technology that’s consistently used by businesses globally. Windows Server 2016 is the most up-to-date version, and certifications aligned with this technology prove your skills are current. The MCSA: Windows Server 2016 certification builds the fundamental expertise needed to develop and manage a Windows Server environment. This is an excellent path to learn the skills to install, upgrade and migrate servers, configure Nano Servers and manage advanced AD DS infrastructure. This certification is also a brilliant way to progress your career and study new aspects of Windows Server 2016 that you may not have previously been exposed to. Plus pass just one more exam to achieve the MCSE: Cloud Platform and Infrastructure – the highest level of Microsoft certification currently available. If cloud technology appeals to you more than servers, consider achieving the MCSA: Cloud Platform certification. This MCSA links together 5 Microsoft Azure (Microsoft’s cloud platform) exams. With huge changes to Microsoft certifications in 2016, you now have a wide range of exams to choose from when achieving your MCSA: Cloud Platform certification, ranging from Big Data to infrastructure and development. Created by the BCS (the British Computing Society), the Certificate in Information Security Principles (CISMP) is a foundation-level certification designed to build and prove skills in information security management. Specifically, this certification will build your knowledge in cyber security, risk management, social media vulnerabilities, cloud computing and more. ITIL certification is ideal if you have an interest in information security – whether you’re a university graduate or have recently completed an IT apprenticeship, this certification is ideal. There are no entry requirements for the CISMP certification, but it’s recommended that you first read Information Security Management Principles for an introduction to the area. To achieve the certification, the BCS recommend training with an accredited provider, like Firebrand. ITIL (Information Technology Infrastructure Library) is a body of knowledge and set of best practices for IT service management. The methodology has been widely-adopted and thousands of organisations across the UK now utilise ITIL to improve the performance of their IT services. The ITIL Foundation is an entry-level qualification that proves you possess fundamental knowledge across all areas of ITIL. If you’re working in an organisation that uses ITIL, achieving the ITIL Foundation is essential for you to properly integrate within the IT team. When hiring, businesses that use ITIL will favour candidates with a proven knowledge of ITIL gained through certification. CompTIA is the world’s leading provider of vendor-neutral certifications - no entry-level certification list is complete without a reference to this giant. One of CompTIA’s large certification library, the Security+ is an important stepping stone for a career in IT security and proves your knowledge of cryptography, access control and tools and procedures for responding to security incidents. If you’ve already passed the CompTIA A+ and Network+, achieving the Security+ is your next logical step in the certification pathway. Plus, the Security+ cert is recognised in the IT industry, many companies, including the U.S Department of Defence (DOD), list it as a requirement for cyber security roles. The CompTIA Cloud+ is aimed at professionals with 1-2 years’ experience working with networks, storage or data centre admin. It shouldn’t be confused with CompTIA’s Cloud Essentials, which is an introduction to cloud for non-technical professionals. Passing the single Cloud+ certification exam will certify your knowledge of cloud models, virtualisation, infrastructure, security, resource management and business continuity. 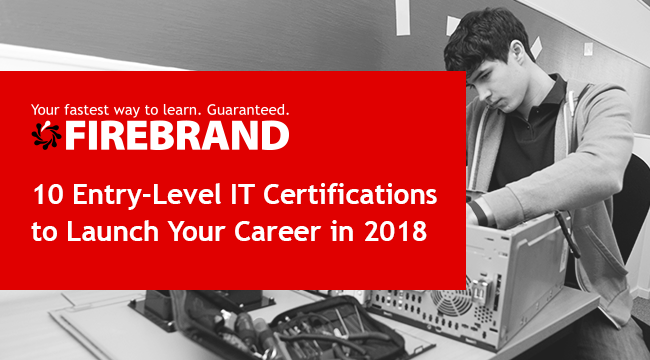 This year CompTIA are introducing stackable certifications, providing a great reason to achieve multiple certifications in 2018. Achieve the Network+ and Cloud+ and you’ll become a CompTIA Cloud Admin professional. More information on stackable certifications can be found through CompTIA. Regardless where you are in your career, Firebrand is your fastest route to achieving new skills and certifications. Find out how you can train at twice the speed across over 600 accelerated IT and project management courses.